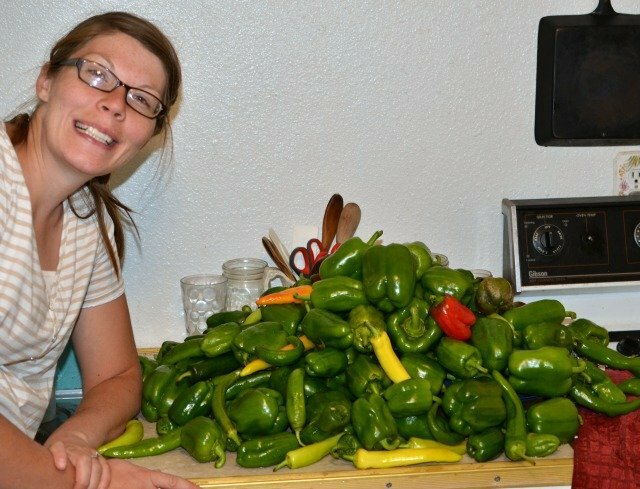 Hobby Farm > Preserving the Harvest > How to save green peppers – the best and easiest way! Sometimes life gives you lemons and so you make lemonade. And other times life gives you way too many bell peppers, and then what do you do?! We had a HUGE garden this year and before I knew it, it froze! Most of my plants died last week in the freeze and so that meant I had lots and lots of things that needed picking right away. 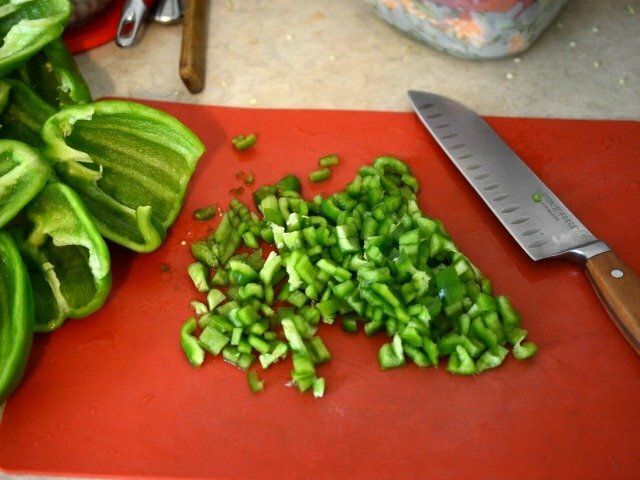 We picked about 10 gallons of green peppers which turned into about 4 gallons of chopped green peppers in the freezer! That’s a lot of green peppers. No garden you say, no worries! This time of year most people have way to much in their garden, including the cute farmers at the farmer’s market. I used to go down to the farmer’s market an hour or a half hour before it was scheduled to end and make deals with the farmers on their remaining produce. They don’t want to cart extras home and so they were always willing to make a deal. I’d normally pay $1 for 6 bell peppers this time of year from the farmer’s market which is a great deal. Bell peppers are something that I don’t normally buy from the grocery store because they are super expensive and they are on the “dirty dozen” list. That just means they are one of the top 12 contaminated fruits or vegetables. I don’t go crazy with organic stuff but I do try to avoid those 12 things. It makes a lot of sense to use what is in season when it’s available because the quality and price are at their best. And if you save a little for the cold winter months you are ever smarter. Bell peppers are SO easy to preserve and here’s how I do it! Really! It’s that easy. I don’t lay them on a pan to freeze in a single layer, you don’t have to blanch them first, just chop and freeze. If they get stuck together in the bag (because they are a bit wet when you put them in) just smack the bag down on the counter like you would a bag of ice that melted together. These are great used in dishes that are cooked and I don’t recommend them for things like a green salad. 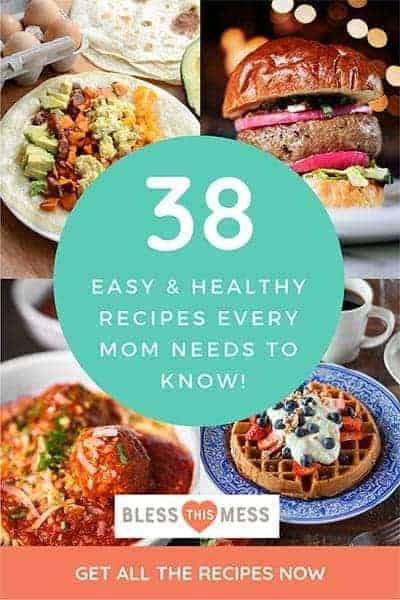 Plan on throwing them in chili, soups, Easy Egg and Potato Breakfast Casserole, pasta sauce, and things like that. 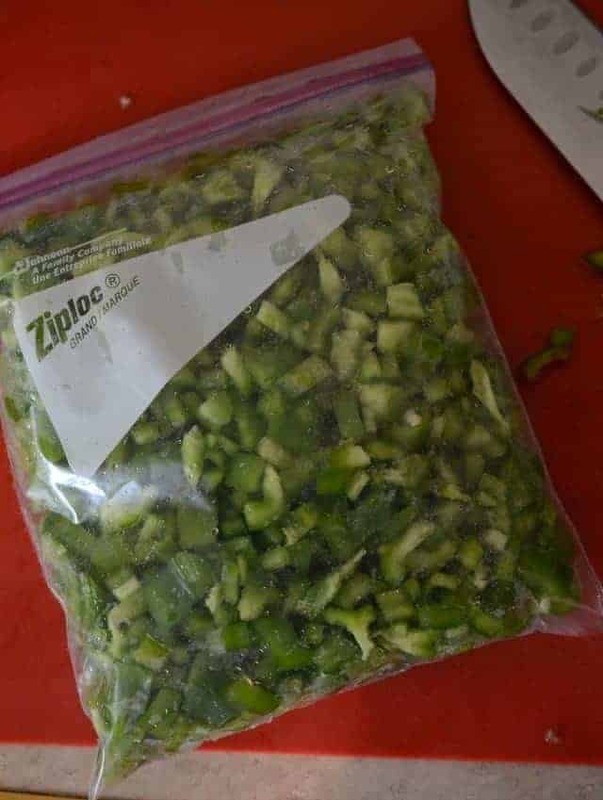 I normally plan on about a half cup chopped frozen green pepper for every fresh pepper the recipe calls for. Wasn’t that easy! And yes, I have a little over 4 GALLONS of frozen bell peppers in the freezer as we speak! Just call me the crazy pepper lady. Have I convinced you to pick up a few extra peppers this week at the farmer’s market? Thanks so much for stopping in and have a great day! Holy moly, you really have that many green peppers?! I need to take gardening tips from you! I absolutely love that you shared this. 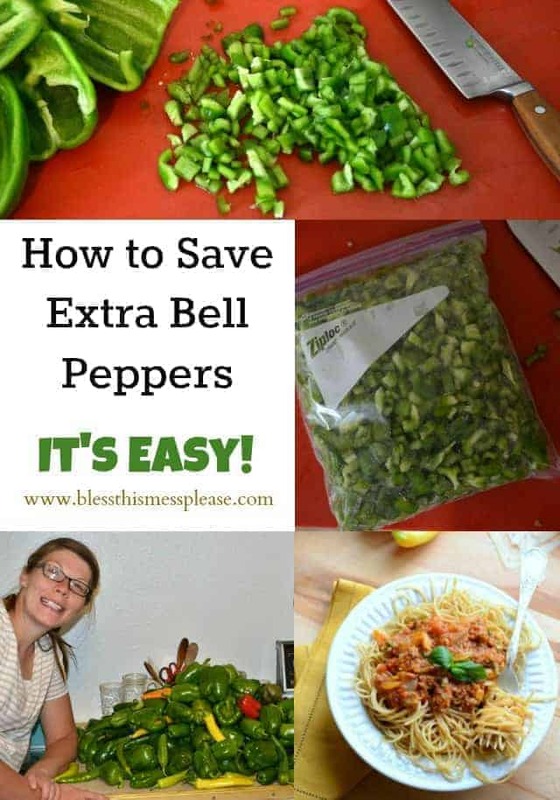 Despite my lack of gardening skills, I still always end up with leftover peppers so these tips are great! I’ll be honest… I wasn’t excited when I was looking at all those peppers 🙂 But now that they are stored and saved I’m really happy about it 🙂 We planted a BIG garden this year! Thanks for the comment! I just realized your posts haven’t been showing up in my FB feed for ages. 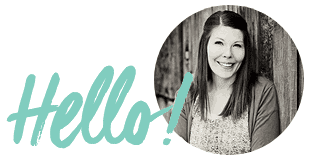 So I came over here to see if you were taking a break but you’ve been blogging away! Anyway, as soon as I saw this post, I ran to my husband with my laptop in hand. He loves green peppers and we love talking about our future garden and I showed him your garden and we were both in awe. It’s amazing! About how many hours per week do you spend on the garden? We don’t use any pesticides (expect some on my pumpkins because I knew that we wouldn’t be eating them…). That is a big reason why I grow my own is because I can control all that. Sure my corn has a caterpillar at the top of most of the ears but we feed the bugs to the chickens and cut off the part they ate. It’s not a big deal to me… I did have a million and one squash bugs and I spent a lot of time killing them by hand! You just have to pick your battles I guess, but it’s totally feasible to garden without chemicals! I discovered using Castile soap solution on my cucumber plant to kill squash bugs saved my plant. They die quickly and the soap isn’t harmful to plant. I just spent time spraying bugs. It doesn’t kill eggs but I just cut them off plant and put in zip lock bag and put them in trash. The Ball Blue Book (my canning bible if you will) says that they are good for 12 months in a 0 degree freezer. Not too shabby! Are you able to eat them plain after freezing? Like when I buy peppers, it’s to chop them into slices and dip them in greek yogurt flavored with a ranch packet.. Would you recommend the frozen ones for this? Or only for cooking? I would only use them for cooking – I throw them in eggs, soups, taco meat or chilis, and that kind of thing. If you just let them thaw they are kind of mooshy. I would try the dip though… it could work great or it might be a too soft of a texture. I’d love to hear how it goes! Thank you for this tip. I had never grown Bell peppers before so I thought I’d give it a try. I have so many, I guess I did okay. Thanks so much…perfect solution found! I do this every year when the garden is full of peppers and then use them all winter long, so glad you found it helpful too!